A new, once-off documentary, set to be screened on TV3 this weekend, asks some of Ireland’s top rugby players to experience first-hand the everyday challenges of being physically disabled in Ireland. 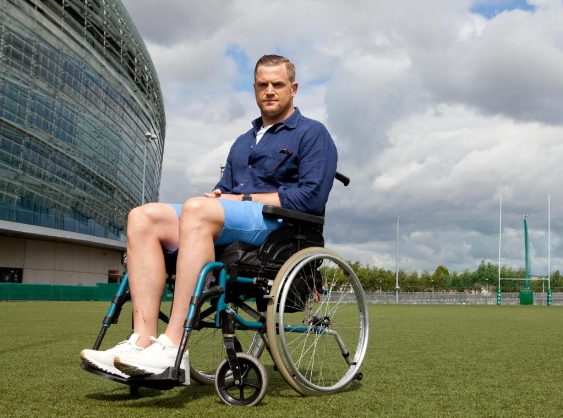 “Rugby’s Wheelchair Challenge” will see four rugby stars – including vice-captain of the Ireland team, Jamie Heaslip – making their way from Dublin’s Aviva Stadium to Limerick’s Thomond Park, all while using a wheelchair. Narrated by sports broadcaster Ger Gilroy, the documentary will show their experiences as they try to access and use buses, trains and taxis – as well as pure muscle – to journey on a road less traveled. The programme is the brainwave of Stephen Cluskey, accessibility advocate and founder of GoAccessible365.com. Stephen uses a wheelchair himself, following an accident at the age of eighteen, and aims to raise awareness of accessibility issues for people with disabilities in Ireland through the documentary. Áiseanna Tacaíochta (ÁT) is an official partner of GoAccessible365.com. It enables wheelchair users across Ireland to source reliable, accessible travel options, and campaigns to raise accessibility standards across public and private transport. Director of ÁT, Martin Naughton, said, “we’re really looking forward to seeing the accessibility issues faced by people with disabilities every day being explored in such a unique and open way. It’s absolutely crucial that awareness of these issues is continually strengthened so that we can generate understanding and bring about positive change together. We wish Stephen and all involved with the production the very best of luck!”. To find out more about GoAccessible365.com, please click here.